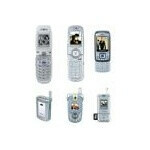 Samsung today officially announced their 2004 GSM line of mobile phones. The list below contains only the ones that have not been announced before. Samsung also unveiled several European models only (900/1800 Mhz) which are not included here.